Ex Display 2018 Williams 345 Sport lying Salterns Marina, Poole. Powered by a Rotax Ace 903 3 cylinder 90HP Engine. This specificatoin includes; Ocean Blue Tubes, Teak footwells and bathing platform, Boarding pole, LED lights. The latest edition to this thrilling range gives those with smaller yachts the opportunity to truly experience these high-performance, super-fun tenders. Designed to fit on the back of 16m+/52ft+ motor yachts - currently displayed on the back of a Princess 56. it might have a smaller LOA, but that doesn’t stop it seating five adults. The BRP Rotax engine also packs a punch, while the sports hull gives impressive stability to create an exceptional craft. Whether you’re pulling a skier or going in search of unspoilt turquoise coves and deserted golden beaches – it’s always a pleasure. Immediate delivery. RRP - £35,056 inc vat. Ex Demonstrator price £32,950. Please call Boats.co.uk at Salterns Marina. 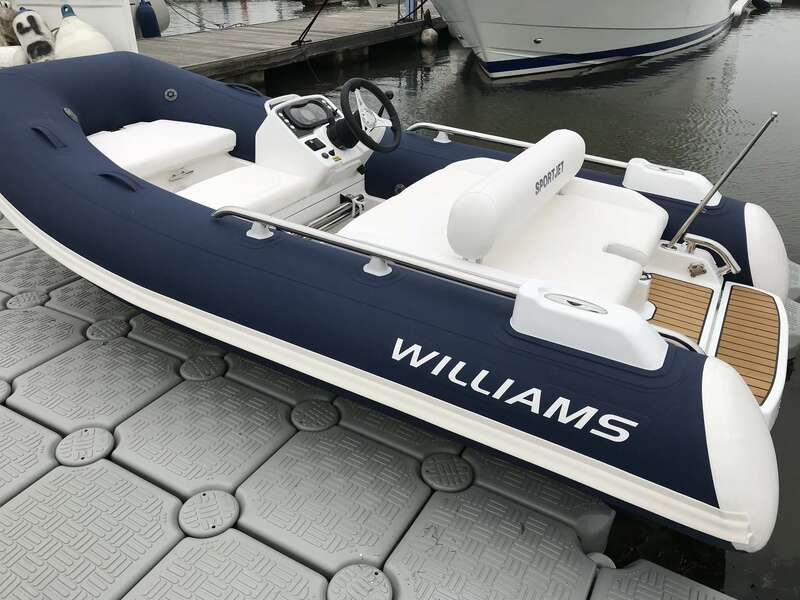 Poole BOATS.CO.UK ARE THE UK'S DEALERSHIP FOR WILLIAMS PERFORMANCE JET TENDERS. WE SPECIALIZE IN NEW AND PRE-OWNED WILLIAMS. WE CAN PART EXCHANGE AND BUY OUTRIGHT. Contact or email Darren@Boats.co.uk on 01702258885 for more information. Buy this boat for as little as £365.09 per month. per month. Insure this boat for as little as £362.45 per year.